Strong detangling comb made of rosewood from Sibel. 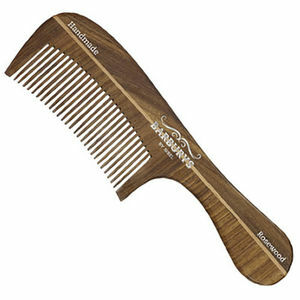 Sibel Barburys Rosewood Comb No.6 is one of a new line of combs for men made of rosewood, which is characterized by its hardness and resistance to humidity. Handmade and anti-static, this detangling comb would make an attractive addition to any barber shop or salon. No.6 is a 190-mm detangling comb. Strong barber comb made of rosewood from Sibel which is characterized by its hardness and resistance to humidity. No.1 is a 17-cm barber comb. Strong barber comb made of rosewood from Sibel, that is handmade and anti-static, as well as being tough and resistant to humidity. No.3 is a 16-cm barber comb. Strong barber comb for men made of rosewood from Sibel, that is handmade and anti-static, as well as being tough and resistant to humidity. No.4 is a 195-mm barber comb.